Northern Lights Resources (CSE:NLR) is pleased to announce an update and the exploration plan for the Company’s Medicine Springs silver-zinc-lead project located in Elko County, Nevada. Note that the production and previous drilling results, including assay information that is included in this news release is historical in nature and is not NI43-101 compliant and cannot be relied on. This information has been sourced from “Geological Report and Summary of Field Examination, Medicine Springs Property Elko County Nevada, January 15, 2018” available on the Company’s filings on SEDAR . Northern Lights has entered into an agreement to acquire 100% of the Medicine Springs Project (“Medicine Springs” or the “Project”) located in Elko County Nevada. Medicine Springs is an advanced exploration project with extensive drilling and many significant silver-zinc-lead intercepts. The zone of mineralization is oxidized to depths in excess of 190 meters and is open to expansion along strike in favorable horizons and laterally in silicified reactive Permian sandy and silty carbonates. The system is well-developed as deep as it has been drilled and older favorable rock types have potential for similar mineralized material, possibly in sulphide form. This is a consistent pattern in replacement deposits observed in the Great Basin, Arizona and in the Central Interior as well as the famous Cerro de Pasco district in Peru. During the 1980’s and 1990’s a total of 125 reverse circulation holes were drilled on the Project license area totaling 5,442 meters (average depth 43 meters). This drilling identified a large zone of mineralization close to surface with high silver grades up to 182 g/tonne (over 7.6 meters) and high combined zinc plus lead grades of over 17% (over 4.6 meters). 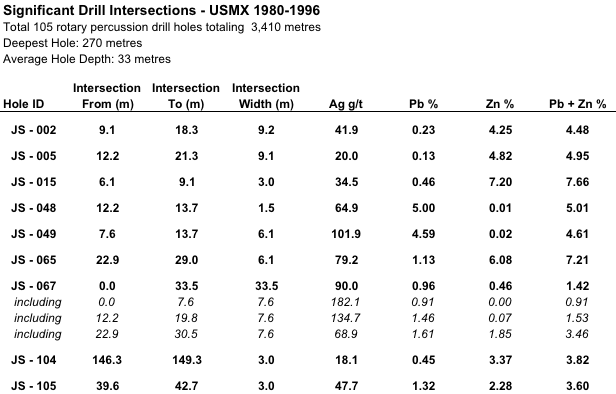 See Table 2 and 3 for further details on historic drilling intercepts. Historic exploration work has identified a mineralized footprint that extends 3.4 km in strike and approximately 1.4 km in width. – Geochemical soil survey over entire license area utilizing for Ionic leach analysis. Results of the 2018 field work campaign are expected to be available by the end of mid-December 2018. 2) The discovery of an economic carbonate replacement sulphide deposit at depth below the oxide zone. On August 20, 2017, Northern Lights entered into an Option Agreement to acquire a 100% interest in the certain mineral claims known as the Medicine Springs Property, situated in Elko County, Nevada. On The Medicine Springs property is located in southeastern Elko County, Nevada and comprises 149 unpatented mineral claims covering 2980 acres (1189 ha). The land is under the jurisdiction of the U.S. Bureau of Land Management (BLM). The property is readily accessible by a network of county and state roads which connect to Interstate Highway I-80, situated 12 miles (18 km) to the north. The nearest population center is Elko, Nevada which is situated 100 miles (160 km) to the northwest. Elko serves as a major support base for numerous large gold mines currently operated by Newmont Mining and Barrick Gold. The Option Agreement is for a 6-year term. Completion of the Option Agreement is subject to staged payments of cash totaling $950,000, equity consideration of $250,000 and a minimum expenditure on the Property of $2,700,000 which are summarized in Table 1. The mineral claims comprising the Property, are subject to a 2% Net Smelter Royalty (‘NSR’) with an additional 0.5% NSR applicable to the 123 claims previously owned by Newmont Mining Corporation. Previous historic production from the Medicine property was reported to be 160,000 kilograms of lead, 770 kilograms of zinc and 480 kilograms of silver from the early 1900’s to 1956. In the 1980’s and 1990’s several companies including USMX, Cominco and Silver Reserve did exploration work on the Project including drilling and geophysics. Geophysical worked completed by Cominco in 1996, identified three strong resistivity anomalies that are in part coincident with the Gold Pipe mineralization. The resistivity response is related to intense oxidation, decalcification and argillization of the limestone host rocks. A total of 125 drill holes for 5,442 meters (average depth 43 meters) was completed on the property in 3 drill campaigns dating back to 1980. Over 85% of this drilling was undertaken on the Golden Pipe deposit. Historical exploration defines a zone of silver-lead-zinc mineralization that extends in a northeastern direction for 3,400 meters and is over a 1,400 meters in width. Past drilling covers less than 10% of the known mineralized zone. Drill results indicate the mineralization is open along strike and below a depth of 600 feet (180 meters). Significant drill intercepts include high silver grades up to 182 g/tonne (over 7.6 meters) and high combined zinc plus lead grades of over 17% (over 4.6 meters). 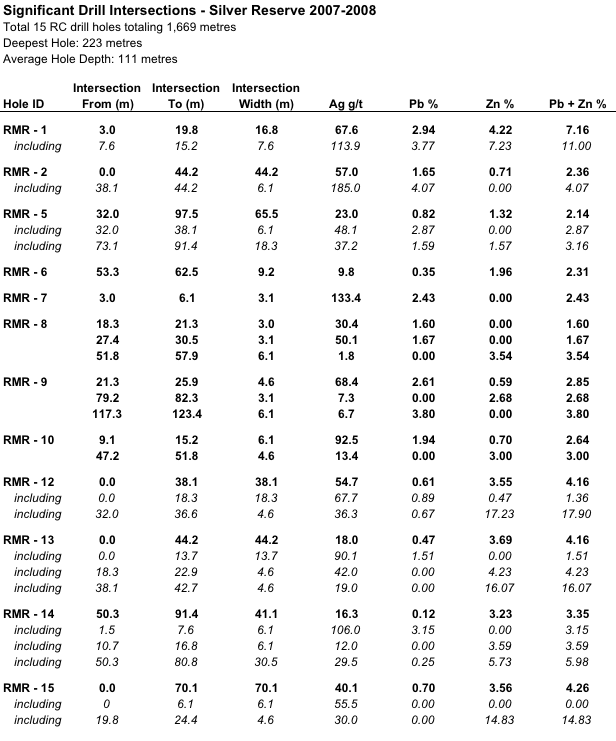 See detailed historical assays in Table 2 and Table 3. The property is underlain by Permian to Triassic carbonate stratigraphy consisting of silty limestone, calcareous siltstone, shale and minor calcareous conglomerate. The mineralization comprises two settings occurring as barite-silver-lead-zinc veins and breccias developed along high angle structures and as horizontal replacement of strongly altered Permian carbonates. The Property lies along the contact between the Triassic-age Park City Group and the Permian-age Gerster Formation (subdivided into upper and lower members) in an environment within the greater region which includes silver and gold in veins, Carlin – style disseminated gold and silver deposits, copper and polymetallic skarns, and stratabound breccias, and jasperoids. 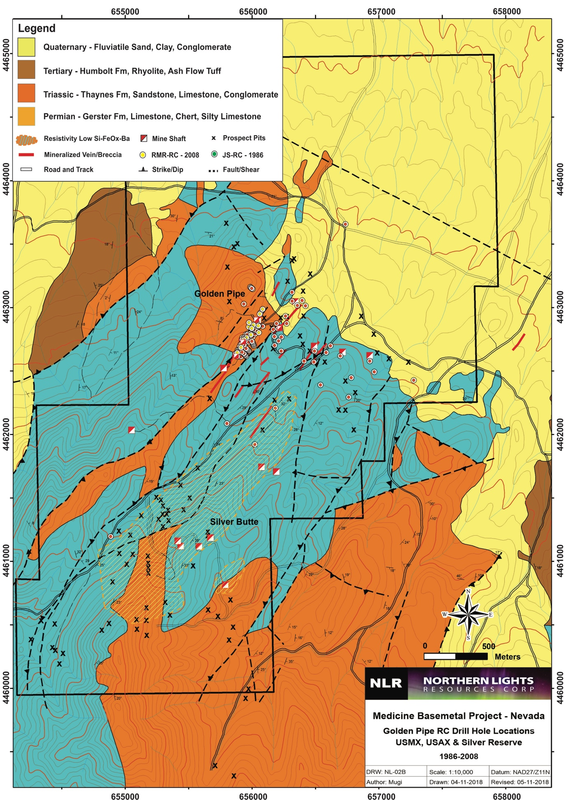 The primary historic target was silver-zinc-lead-barite oxide mineralization localized along NW and NNE trending fault and fracture systems and hosted by porous/reactive horizons in Permian silty/sandy limestones. The mineralized zones are expressed as breccias, jasperoid, decalcification, and oxidized barite-bearing rubble. The mineralized material is known to be oxidized to the maximum depth of the data available, approximately 190 meters. The oxide Ag-Pb-Zn mineralization may overlie sulfide-rich mineralization which has not yet been encountered in the relatively shallow drill holes completed to date. Historical shafts and pits located in the Golden Pipe and Silver Butte prospects are controlled by two sub-parallel northeast trending fault zones. Alteration observed in outcrop and in drill cuttings is dominated by jasperoidal silicification and argillization of the limestone and shale units which is associated with intensive oxidation. Geological analogues for Medicine Springs type silver-lead-zinc mineralization are observed at the Maverick Springs and Lone Mountain deposits located within the same northeast trending metallogenic zone and hosted by Permian carbonates. The planned exploration program for Medicine Springs is structured in two phases. The Medicine Springs Phase 1 Exploration Program includes a review of all historical exploration work, development of GIS data compilation, completion of geophysical work including Aeromagnetic and CSAMT surveys, detailed surface geological and sampling mapping and a comprehensive geochemical soil sampling survey. The results of the Phase 1 Exploration program are expected in December, 2018. The Medicine Springs Phase 2 Exploration Program includes a targeted drill program focused on further delineation of the oxide mineralization zone and the identification carbonate sulphide replacement style mineralization at depth below the oxide zone. Historical drilling has identified oxide mineralization to at least 180 meters depth from surface. vi.Geochemical soil survey over entire license area utilizing for Ionic leach analysis. A detailed NI43-101 Technical Report titled “Geological Report and Summary of Field Examination, Medicine Springs Property, Elko County, Nevada” dated January 15, 2018 has been filed on SEDAR (the “NI43-101 Report”). The NI43-101 Report was completed by independent geologist and qualified person, Robert Lunceford CPG, M.Sc. 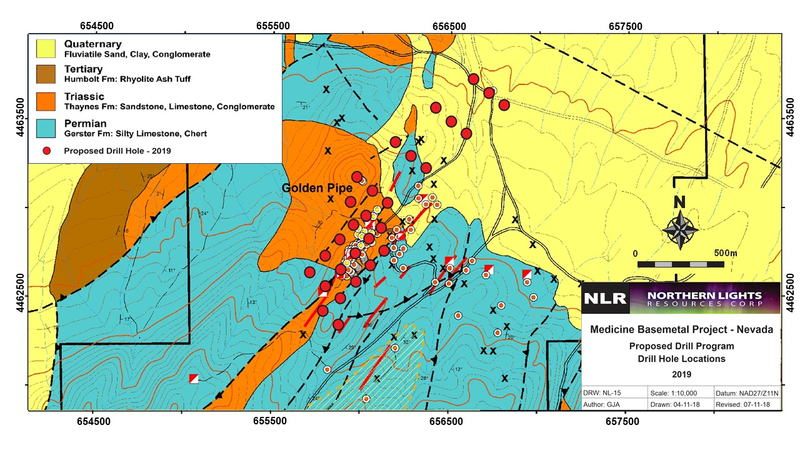 The NI43-101 Report provides a comprehensive overview of past known exploration activities on the Project and a detailed discussion of potential analogue models for the Medicine Springs Project. The NI43-101 Report suggests two geological models are applicable to the Property. The first is high-angle, structurally controlled silver and base metal mineralization hosted by and associated with jasperoids, breccia, and mineralized replacement of the Permian and Triassic carbonate units. Peripheral to these high-angle structures, the drilling documents a replacement-style mineralization developed within favorable carbonate beds. This combination of structural and stratigraphic control is typical for many precious metal deposits in Nevada including the carbonate replacement type deposits. These deposit types are also characterized by zoning and significant vertical extent in contrast to epithermal deposits. The NI43-101 Report goes on to suggest that the Medicine Springs Property mineralization has geologic similarities to the Taylor Zn-Pb-Ag deposit owned by South 32 following the acquisition of all the issued equity in Arizona Mining Inc. The Taylor deposit hosts four stratigraphically controlled orebodies, including the Central Oxide, Upper Taylor and Taylor Deeps Sulphide zones. The upper Central Oxide is a manto-style, manganese-silver deposit hosted by Jurassic rhyolitic breccias and developed along the upper contact of a down-faulted block of Concha Formation carbonates. The sulphide mineralization is associated with calc-silicate alteration that is most probably related to Tertiary magmatism, evidenced by the presence of dykes and sills observed in the Epitaph Formation. – Geochemical signature and alteration of the mineralization are somewhat similar. The geologic comparison of the Medicine Springs Property to the Taylor deposit is preliminary and entirely speculative and can only be tested by extensive phased exploration studies. Northern Lights has compiled all historic exploration work (drilling, surface samples, geophysics, geological mapping) into GIS data base. Northern Lights has completed detailed surface mapping and rock sampling of the Medicine Springs mineral license area. The mapping was completed in September 2018 on a 1:5000 metric scale. Northern Lights has completed an aero magnetic survey over the entire license area. A total of 310 line kilometers at a spacing of 50 meters was flown. Interpreted results have not yet been received but are expected by the end of November 2018. Northern Lights has engaged Zonge (Australia) to complete a 2D reinterpretation of the Cominco geophysical data with results expected by end of November 2018.
vi.Ionic Leach Geochemical Soil Survey over entire license area. Northern Lights currently has a soil sampling program underway where approximately 790 samples are being taken on 100 meter centres across the license area. 4.The samples will be assayed by ALS in Vancouver using a 62-element Ionic Leaching analytical method. Ionic leaching is a very cost-effective way to detect subtle, coherent multi-element anomalies in surface soils that can represent metal zonation and multi-element haloes, associated with buried mineralized systems. Multi element ion anomalies give concise fingerprints directly above targets that can be used as a guide for drilling. 5.Results are expected by end of November 2018 with the final interpretation completed by mid-December. The results of the Phase 1 Exploration Program will be to enhance the understanding of the mineralization system at Medicine Springs and to be used as guidance for a comprehensive drill program in 2019. The goals of the Phase 2 Exploration Program include further delineation of the oxide mineralization zone and the identification of sulphide carbonate replacement style mineralization at depth below the oxide zone. It is estimated that a 5,000 to 8,000 meter drill program will test the two target types. The program will comprise 26-30 vertical drill holes ranging from 150 to 500 meters in depth and covering a strike length of approximately 2,000 meters. 8.About Northern Lights Resources Corp.
2.Del Undur Project – Northern has entered into an agreement to acquire 100% equity interest in Del Undur polymetallic and titanium exploration project located in in northeastern Mongolia. CAUTIONARY STATEMENT REGARDING FORWARD-LOOKING INFORMATION: This news release includes certain “forward-looking statements” under applicable Canadian securities legislation. Forward-looking statements include, but are not limited to, statements with respect to: the terms and conditions of the proposed private placement; use of funds; the business and operations of the Company after the proposed closing of the Offering; and the relisting of the Company’s shares on the CSE. Forward-looking statements are necessarily based upon a number of estimates and assumptions that, while considered reasonable, are subject to known and unknown risks, uncertainties, and other factors which may cause the actual results and future events to differ materially from those expressed or implied by such forward-looking statements. Such factors include, but are not limited to: general business, economic, competitive, political and social uncertainties; delay or failure to receive board, shareholder or regulatory approvals; and the uncertainties surrounding the mineral exploration industry. There can be no assurance that such statements will prove to be accurate, as actual results and future events could differ materially from those anticipated in such statements. Accordingly, readers should not place undue reliance on forward looking statements. The Company disclaims any intention or obligation to update or revise any forward-looking statements, whether as a result of new information, future events or otherwise, except as required by law.